To some, the endless mascot controversies have left readers numb. Why cover another mascot controversy again? Because, mascots aside, this is emblematic of what is happening across our culture and on our university campuses. The culture wars are under-way and mascots are merely a window into what is happening across the country. While there are surely inequities that must be righted - rewriting history, eliminating founders, changing nicknames, and changing mascots appear to be window dressing and fail to address real issues that impact people today. So what is happening at Rutgers? Prior to the current Mascot the Scarlet Knights, Rutgers was represented by the Chanticleer, However, the choice of Chanticleer as a mascot was often the subject of ridicule because of its association with "being chicken". In 1955, the mascot was changed to the Scarlet Knight after a campus-wide election, beating out other contenders such as Queensmen, the Scarlet, the Red Lions, the Redmen and the Flying Dutchmen. The current Scarlet Knight is a caucasian male, blue eyes, frozen smile, giant foam burgonet helmet, a scarlet plume, and huge hands made to look like gauntlets. While we certainly missed a few, this shows the absurdity of trying to represent everyone or everything in a mascot. How does one even decide which 'Scarlet Knight' goes to which event? They will need to hire a full-time mascot traffic cop. And after all, does a Boiler Maker, a Corn Husker, a Tiger, a Jayhawk, or a Tree truly represent all stakeholders at a university? David Jones in PennLive states in his opinion piece, "Honestly, I want to see the new third-gender Knight. I might actually pay to attend a Rutgers football game just to see this." Perfect representative of most everyone trawling about the many different Rutgers campuses. Mascots are all about looking backwards, not forwards. They are about tradition and heritage - connection. Rutgers is an embarrassment. Today the football coach was fired. Players have been and are being arrested. Coach contacting professor about grades; an art class I think. The AD was fired today after about two years. Sge came with baggage and never should have been hired. Rutgers is not a Big 10 caliber college, except for women's soccer, and maybe men's soccer. Tax dollars being spent on a crap athletic department. Mascot? Rutgers has bigger issues. In-state highly-qualified students don't go there. It's a joke. I live 5 miles from the RU campus. Don't worry, it's safe where I live. Today is a easy day to pick on old RU, but the same is true on almost any day. Scarlet Knight mascot is fine and will stay. Even the most liberal faculty and deans at RU think it's a stupid issue. 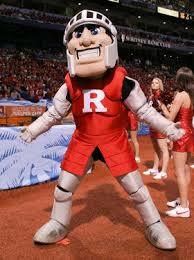 FYI, during football games, RU has a additional Scarlet Knight dressed down somewhat that rides a horse onto the field. It's pretty cool. RU is in the B1G because it's a major research university. As above poster alluded to, kids in undergrad school are at RU because it's cheap and they didn't get in anywhere better. (RU undergrads are not as bright as DU undergrads, no way Jose) The athletic department has been in total chaos for years. Remember, this is also the school who recently had to fire a basketball coach for running naked free throw shooting contests and fire another for throwing basketballs in kids faces from 5 feet away along with constant verbal and physical abuse.